Eddy Arias remembers the night he was pulled over by the Houston Texas police. It was first time he had ever interacted with law enforcement since he’d moved to the U.S. from Mexico as a child. He still remembers every moment. When Eddy realized he’d been racially profiled, he stood up for his Constitutional rights. But what happened next drew him into a much larger debate about police enforcing immigration laws. Houston is home to thousands of immigrant families. On paper, police don’t enforce immigration laws on the streets. There are policies against this. Yet several successive mayors have refused to call Houston a “sanctuary city” for immigrants. For many years, the Harris county jail in Houston has collaborated with Immigration and Customs Enforcement (or ICE). That means if someone is arrested, they can ultimately be transferred to ICE for deportation. This is called a “287g” agreement. Eddy Arias learned firsthand about the way it works. And he decided to do something about it. Thanks in part to his activism as a member of United We Dream, Houston now has a new sheriff. For a broader understanding of Indefensible’s goals, read IDP’s companion piece. Eddy (E): I saw the lights of a patrol car and this officer approached me. I had never been stopped before. So I.. immediately I was scared. All these things that I had already you know practiced in my head came to me and then I knew what to do. Will Coley: You are listening to Indefensible. Trump: Cities that refuse to cooperate with federal authorities will not receive taxpayer dollars. Parker: Houston is not a sanctuary city. Valdez: This epicenter of oppression in Houston is the Harris County Jail. But that’s one place where we can make an impact for our communities. E: This is the land of the free… but only for some. Gonzalez: 287G is a dangerous program that encourages racial profiling. It separates families. It doesn’t keep our communities much safer and it’s a waste of taxpayer dollars. WC: Stories of people resisting deportation. I’m Will Coley. Eddy Arias remembers the first time he arrived in Houston, Texas. It was 2002 and he was fourteen years old. Eddy came to reunite with his parents. He’d been living with his grandparents in Mexico and hadn’t seen his mother and father in two years. E: My dad picked me up. The last time I’d seen him, I was shorter than him and this time I was taller than him. It felt so, so weird. It felt like it was like we had drifted apart, you know. Uh we drove into Houston and I do remember you know driving through the highway and it felt like we were going so fast. And just seeing, you know, all these lights and downtown was just like. It looked like I was in a movie. It felt so surreal. The first thing that I remember eating was Burger King. And I had a hamburger and I never had one before. And I hated it. It tasted horrible. And that was my first time here in the U.S.
WC: Eddy wasn’t a fan of American fast food but he adapted to life in the U.S. He did well in school. He learned English and with the help of a guidance counselor, received a college scholarship. He didn’t let his undocumented immigration status limit his choices. Houston is home to thousands of immigrant families like Eddy’s. Former Mayor Annise Parker told the Texas Tribune in 2010 that police don’t enforce immigration laws on the streets. Parker: We don’t divert our police officers to stop people on the street and inquire about immigration status. And that’s a waste of resources. WC: But the Houston Police and Harris County Sheriff’s Department maintain public safety. Checking resident’s immigration status could result in racial profiling and undermining community trust. 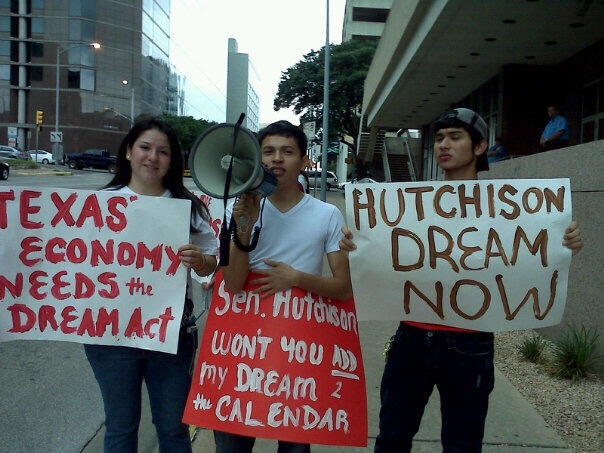 Even though police avoid enforcing immigration laws in Houston neighborhoods. Parker: Houston is not a sanctuary city. If you break a local law in Houston, we will arrest you. We will take you to jail. We will run your information and if you are in this country illegally we will turn you over to the appropriate federal agency, generally ICE. And we will do it day after day after day. And we have been doing it for a very long time. WC: For many years the Harris County Jail in Houston has collaborated with Immigration and Customs Enforcement or ICE. That means if someone is arrested they can ultimately be transferred to ICE for deportation. This is called a 287G agreement, named after a section of the Immigration and Nationality Act. This provides the basis for collaboration between local and federal agencies in the field or in jails. Because of this collaboration, Houston is not considered a sanctuary city and local officials refuse to call it one. Immigration attorney Frances Valdez is familiar with how 287G works in Harris County and how taxpayers support it. Valdez: So we give space to the federal government in the county jail. And we give personnel that was around eight sheriff deputies. Those eight sheriff deputies work with ICE. They do the work of ICE. They dress like ICE in the county jail, which means that they are monitoring anybody who comes in contact in the county jail. WC: Eddy Arias is one of Frances Valdez’s clients who learned firsthand about the way it works. WC: Eddy said no to the officer and asked to have a blood test. The officer arrested him and took him to the Harris County Jail. They took his blood and said he’d need to wait for the results. The booking process took three whole days. He slept on a concrete bench in the freezing cold. And then they took Eddy into a room where ICE officers were waiting. E: And then they start fingerprinting me and I knew at that moment that, you know, it was going to get more complicated. So, doesn’t matter for whatever reason you know I ended up there where other people who are with me in that room, you know, we had never been convicted of any crime yet we are. We are being fingerprinted for immigration. WC: Here’s Attorney Frances Valdez again. Valdez: So, for example if someone has a removal order, they’ve been removed or deported before, their fingerprints would come up and maybe they didn’t even commit a crime. So, this is before charges are filed, before a trial happens. ICE could then put a hold on them and even if they’re no charges filed or charges are dropped or someone is innocent of a crime, they get sent to ICE immediately. E: “The ICE want to offer you 30 days. You want to take them?” And I told him, “What?” I was like, “Are you crazy? I’m innocent.” You know and. And I told him, “I need you to get those test results.” So he said, “Okay.” But you know it’s interesting now that I see that the um judicial system fails a lot of people and a lot of people are willing to just admit that you know this, just so that they can hurry up and you know get out. But it actually happens to a lot of our people you know who are immigrants. They sign something because the attorney doesn’t care, you know just gives them a piece of paper and they sign it. Or for many other reasons you know. So I, remember reading about Mohatma Gandhi when I was in college and I remember this quote that he said, “You can chain me. You can torture me. You can be the strongest body but you can never imprison my mind.” I really had to hang onto whatever little bit of hope that I could to really find the strength to last in jail because a lot of times I just felt like I wanted to sign and get out. Like get deported or something. But, but I couldn’t. There was always that side of me that told me you know, “You are doing the right thing.” So, if I would have signed guilty I would have only had to stay there for thirty days. WC: Eddy waited 45 days for his blood test results to come back. They found that he was not intoxicated. E: 45 days. 45 days. WC: Frances Valdez explains what happens next. Valdez: There’s a holding center in the second floor of the jail where people go either once, like I said, if they were convicted of a crime, once their sentence is served. So if you did commit a DUI, you were found guilty, you were given a certain amount of time in jail, you would still have to go through that sentence. And then the day that you’re supposed to be released from jail, you go to this holding cell where everyone goes before they’re actually released onto the street. But if you’re undocumented or you have a hold, then ICE can literally walk down the hallway and pick you up and then put you in their holding cell and then eventually send you to the detention center by Bush Intercontinental Airport. E: I thought you know maybe I’m going to get out. But no. on my way out of the jail there’s immigration. So, they shackle me, you know, by my hands and my feet It felt like the most humiliating thing in the world because not even in the Harris County Sheriff’s Office they got to me. So, I walk you know with my hands and my feet shackled to the bus. And I knew where I was going at that point. I knew I was going to an immigration detention center. WC: ICE agents took Eddy to the Houston Processing Center, an immigration detention facility. It’s run by Corrections Corporation of America, now called CORE Civic, a for profit prison company. During processing Eddy encountered even more surprises like the intake questions. E: One of the questions was, “Are you gay?” And I told them, “Yes.” Um because I was just being honest. And that question landed me into so much trouble. WC: Eddy was held in segregation or solitary confinement. The officer said it was for his own safety to keep him away from other people in the dormitories. E: That was a horrible experience. Even now like my memory tried to erase that experience. Because I… I lost the notion of time and space. It’s… it’s the worst thing that you can do a human being. I left another message in there too. I wrote, “You are not alone. God is here with you.” And I… I wrote the message in English and Spanish. That’s the only time I ever drawn graffiti anywhere. So, if I’m guilty of anything I’m guilty of, you know, drawing graffiti at Corrections Corporation of America. So, let it be known loud and clear. WC: Eddy begged to be put back with the general population in a dormitory for his own mental health. E: Like, you know, I met all types of people when I was there. There were some people who were waiting on their immigration cases. There was a guy from Africa. For three years he was waiting in jail. This is the land of the free? But only for some. WC: Eddy had an immigration court hearing. By this time he was represented by Frances Valdez, the attorney we heard from earlier. The judge agreed to a bond of $3,500. His parents raised the money from family and friends and Eddy was released. E: All in all, total was you know 45 days plus three weeks of immigration detention center. It was a total of 61 days; not having ever, you know, being convicted of any crime. After that you know I had to ask. You have to go to immigration court but it was delayed for like a whole year for my next immigration court hearing. WC: In court Frances Valdez argued that Eddy was not a priority for deportation according to recent memos from the Obama Administration. She convinced the judge to administratively close Eddy’s case. It wasn’t an immigration status but it meant his case was removed from the court docket. According to the American Immigration Council, only 7% of immigration cases are administratively closed. E: In a way, I was allowed to stay here because I had gone to college and all these things and had met the requirements to be a low priority by ICE. But they were people just like me had done some other things differently but you know, as human beings, they were just as good as me. But I was allowed to stay here. But they were not. So, in a way I feel like you know me doing this interview and uh everything that I doing is for them too. WC: And that’s what inspired Eddy to get involved in local advocacy with United We Dream, a national organization of young undocumented immigrants. Eddy received DACA, Deferred Action for Childhood Arrivals, the temporary status conferred by the Obama Administration to protect against deportation. As the 2016 presidential eelction dominated headlines, there were other races here in Houston that would have a direct effect on people like Eddy. Gonzalez: My name is Ed Gonzalez. I’m currently the Democratic nominee for Harris County Sheriff. WC: I spoke to former city council member, Ed Gonzalez, about the role of 287G collaboration in his campaign for Harris County Sheriff. (on tape) And so how did you identify this issue as being important part of your campaign? Gonzalez: I started seeing the work that they were doing here locally in the United We Dream effort I’ve heard as well, where there were a lot of testimonies and stuff from people that have been impacted by it. And so, um you know I. I was able to get information on their experience, not only here but across the country. WC: Eddy Arias was part of the delegation that met the candidate. E: We gave him a training on 287G. Um we told him you know all the problems with the program as well as uh some constitutional implications of deporting people who were not being you know found guilty of any crime. And he said that on the very first day of him becoming sheriff that he would end the program. Gonzalez: I had to take a position on the issue and so did some more my due diligence to really understand it better and. And so that’s where it really came up. It did become a campaign issue. WC: Frances Valdez says the Gonzalez campaign brought 287G out in the open. Valdez: People that we didn’t even know were asking about it. So, then what happened was 287G became an important issue for the Latino community. Male moderator: So welcome to the Harris County Sheriff debate. WC: Ed Gonzalez debated the incumbent sheriff, Ron Hickman, in October last year. Rebecca Suarez: It’s time for questions; answers to each question. Mr. Hickman, you are a supporter of the 287G program. Why are you such an advocate of a program that some state profile Latinos and can be a source of fear for some in the Hispanic community? Hickman: That’s a great question. Thank you for asking that. 287G has been an issue for several months now. As I renewed the program as my two previous predecessors had, breaking the law in Texas very seriously. So it isn’t 287G that separates family. It’s the violating Texas law. Rebecca Suarez: Mr. Gonzalez you can rebut that. Gonzalez: 287G is a dangerous program. It encourages racial profiling and separates families. It doesn’t keep our communities much safer and it’s a waste of taxpayer dollars. Gonzalez: Upon thoughtful consideration I’ve decided to opt out of a voluntary 287G program. Rally speaker: We’re celebrating our victory. An end to 287G! WC: That same week, advocates held a celebration in Houston. WC: Attorney Frances Valdez thinks the victory says something more. Valdez: This is a symbolic win in the sense of people who had no power, undocumented people who can’t vote, who are told that they don’t matter, got together, told their stories, organized their people and kept fighting. And that’s what this is really about. Abbott: Texas has now banned sanctuary cities in the Lone Star State. Now let’s be clear, the reason why so people come to America is because we are a nation of laws and Texas is doing its part to keep it that way. WC: The law doesn’t come into effect until September but the state’s attorney general already started a lawsuit suing Austin and Travis County for its sanctuary policies. Sheriff Gonzalez is working with Harris County’s attorneys to determine what the law requires of the department. For Eddy Arias, it’s about protecting his adopted home. He says that he’s here to stay. E: When I think of home, to me now it’s here in the U.S. with my parents, having homemade meals and supporting each other. To me home it’s my safe place, my friends and family. Home is Houston. WC: You’ve been listening to “Indefensible.” This podcast is brought to you with the support of the Immigrant Defense Project and the Four Freedoms Fund. Bryan Parras co-produced this episode. Andrew Ingkavet composed our theme music. This week we had additional music from Pinata Protest. Archival footage was used with permission from the Texas Tribune, the Houston Chronicle and Univision 45 in Houston. Kalalea edited this episode. And our audio engineer is Anne Pope. Special thanks to Liana Lopez, Angie Junck, Kemi Bello and Mark Bramhill. Join us next week for another episode of Indefensible. Be sure to subscribe on iTunes or wherever you get your podcasts. And please rate and comment on iTunes so others will find and hear these stories.